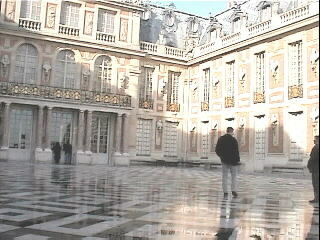 Monday morning, we decided to make the journey to Versailles. It was a half hour journey by train to the Paris suburbs. Our metro pass got us there but we had to pay one Euro per person to get back to the city since Versailles is outside the zone that our three-day metro pass covered. I was interested in seeing Versailles because I remember sitting in my high school French class while my teacher, Madame Belfoure, told us about this lavish palace. It was originally a hunting lodge for Louis XIII but became the official royal palace of Louis XIV after his father's death in the late 1600's. The palace has remained and is now open for tourist to see how the French royalty lived during the 17th and 18th centuries. 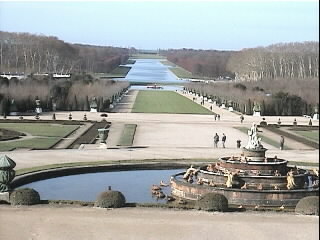 My advice to anyone visiting Versailles is to bring good walking shoes and never visit on a Monday! 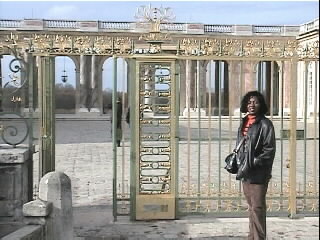 Traci and I traveled to Versailles only to discover that the main chateau is closed on Mondays! How did I miss that in the brochure? Anyway, the huge gardens and the smaller Trianon palaces are open on Mondays. 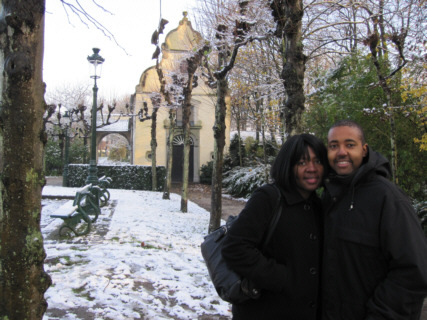 We decided to check these attractions out and maybe come back another day to see the chateau. Somehow, I think both of us knew we would not have time to make it back again on this trip. The gardens of Versailles seem to stretch forever in all directions. There are fountains and statues all over the place. We toured the Petit Trianon and the Grand Trianon. These buildings served as mini-palaces. They are lavishly decorated with 17th and 18th century furniture and paintings. Unfortunately, no photographs were allowed in these buildings. 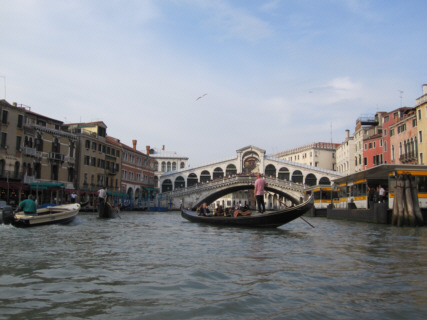 However, it is really worth the trip to see these places. Again, bring good walking shoes or buy a ticket for the tram because it is a long walk on sand and gravel from the chateau to the Trianons. You can rent bicycles but we didn't know this until after we had already spent several hours walking through the gardens and touring the buildings. 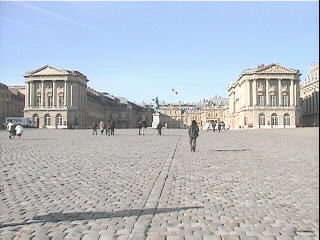 The area in front of the chateau requires a good amount of walking over cobblestone. Our feet were already aching from walking through the gardens all day. The cobblestone really did us in. "Doh! The chateau is closed on Mondays!" "Whew! It's a long walk through the gardens." "At least the Grand Trianon Palace is open on Mondays." Finally, since Versailles requires a lot of walking outdoors through gravel and sand, avoid visiting this attraction on rainy days. Fortunately, we were there on a sunny day. I just wished it wasn't Monday. After spending all day walking around Versailles, Traci and I decided to do something that did not require any walking. 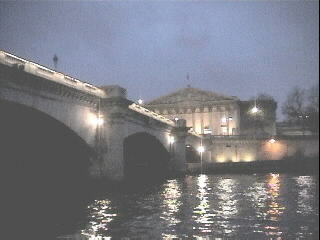 We decided to cruise the River Seine in one of the tour boats docked near the Eiffel Tower. 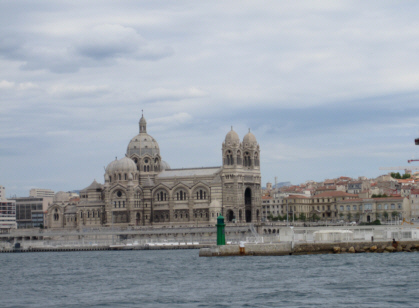 This was a 1-hour boat ride narrated in French and English. This trip was absolutely beautiful. 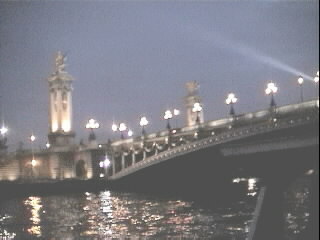 We were cruising the river just as the sun was setting and the city lights were beginning to shine. We saw Notre Dame Cathedral, Place de la Concorde, the Louvre, La Sarbonne University, Invalides, and many other historical buildings. The inside of the boat was heated while the outside was subjected to the chilly air as the boat moved along the river. 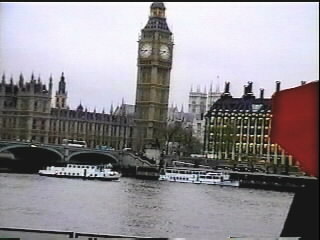 Despite the chilly air, I spent much of the cruise outside with my video camera filming the sights. I highly recommend seeing Paris this way. For dinner, Traci and I decided to try a restaurant recommended by Kim, Philipe, and Percy, who we had met during dinner at Percy's Place Saturday night. The name of the restaurant was Kamukera. 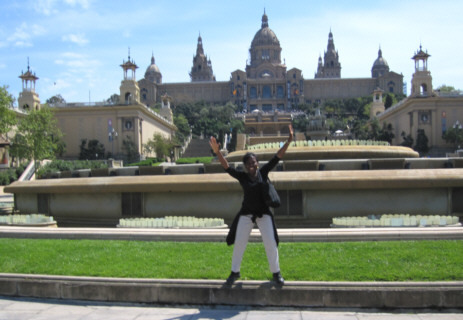 It specializes in African and Antilles cuisine. I had made a dinner reservation for 8:30 p.m.. The lady who answered the phone did not speak English so I was proud when I was able to speak enough French to make the reservation. Well, that pride was short-lived once we got to the restaurant. Traci and I were the only patrons of the restaurant that evening. The only other people there were the lady who owns the restaurant and a cook. Neither one of them spoke English and my French was extremely limited. The interior of Kamukera was nicely decorated with an orange, red, and yellow color scheme. There were African and Caribbean paintings on the walls. There was club and dance music playing on the stereo. 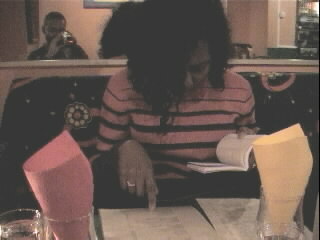 Traci and I thought we'd use the dictionary at the back of our phrase book to determine what items were on the menu. Unfortunately, none of the items were in the dictionary. They were African and Caribbean dishes so even if we could translate them, we still didn't stand much of a chance of figuring out what they were. The owner tried to describe them for us but her French was well beyond the limits of my French vocabulary. I could see she was getting frustrated but she smiled anyway. The only things I recognized on the menu were beans, rice, potatoes, and chicken. I figured, you can't go wrong with chicken. There were three chicken dishes on the menu, so Traci and I chose two of them for our main course and a sampler plate of appetizers. One of the chicken dishes was citricy and the other was spicy. Overall, the food was okay. "I don't see any of this stuff in the phrase book." During dinner, I checked my pocket map and discovered a metro station that was a little closer to the restaurant than the one we used to get there. On the way out, I figured I'd try my luck with the French language one more time. I asked the owner how to get to the closer metro station. She gave me directions in French. I repeated them back to her to confirm I heard her correctly. She responded with, "Non, non, non" ("No, no, no"), and attempted to give me directions again. I was really discouraged at that point. I thought the one thing I was good at in French is understanding direction like right, left, straight, next to, in front of, etc.. Just then an older gentlemen walked into the restaurant and sat at the bar. The owner asked him in French to tell me how to get to the metro station. The man spoke fluent English with a British accent. Where was he when we needed him earlier:)?. He started to give me directions in English but I guess the owner thought he was speaking another language because she jumped in and told him in French, "No, no, no. They are American." This confused the man and me. I assured him I understood English. Anyway, I felt a little better when the directions he gave me were the same as I had interpreted when the owner gave them to me. Whew! We found the metro station and made it back to our hotel in no time. As I mentioned earlier, Traci and I tried to get reservations at the Jules Verne restaurant. This world-class establishment is located in the Eiffel tower and generally require guests to make reservations months in advanced. I had already tried my luck on Sunday by walking up and asking the host for a reservation without any success. Therefore, Traci suggested I ask the concierge at our hotel to see if they could get us reservation. The concierge told us dinner or lunch reservations would be next to impossible on this short notice, but he said he'd give it a try. I had this conversation on Sunday afternoon and had not heard back from the concierge. Monday night as Traci and I returned to our room from dinner at Kamukera, Traci found a little note next to the television. She opened it and discovered that the concierge had succeeded in getting us lunch reservations at Jules Verne. The only problem was the lunch reservations were for noon on Monday. We found the slip of paper Monday night at 11 p.m.. I wondered how long that note had been sitting next to the television. The next morning I explained to the concierge that we found our lunch confirmation notice too late. He said he did not think there was much that could be done at this point but he would give it a try. He told me to give him a different name under which to make a reservation. He then called the restaurant and carried on a French conversation. He paused for a second, turned to me and asked, "Is 12:15 today good for you?" I answered yes, he spoke some more on the phone, hung up, and turned to me and said, "You and your wife are confirmed for lunch at Jules Verne at 12:15 today." Whoa! I don't know what he said on the phone to pull this one off but this guy was awesome. I thanked him and went off to tell Traci the good news. We had a few hours to kill before lunch so we took the metro to see Sacre Coeur Basilica and Montmartre. Sacre Coeur is a beautiful church that sits on a hill. You can get a great view of the city from there. There are lots up steps leading up the hill to the church. We took the tram to the top instead of walking. Our metro passes took care of the admission cost for the tram ride. I was amazed by the sculptures and carvings all over the church. So much attention to details was given when creating this cathedral. Montmartre is an artist community in the area surrounding Sacre Coeur. The only things we found there that day were souvenir shops. After visiting Sacre Coeur, we took the metro to the Eiffel Tower for our Jules Verne lunch. We were crammed into a little elevator and taken to the restaurant at the second stage of the tower. I felt a little out of place because the other people on the elevator were wearing suits and dresses. Traci and I had on our street clothes. I could understand wearing suits and dresses for dinner, but for lunch? I felt a little better when the couples at the tables next to us were also dressed casually. The meal was outstanding and the view was great. 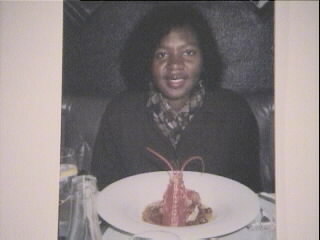 Traci had lobster in some type of sweet sauce as her first course. She talked about that lobster dish for the rest of the day. I had a delicious pastry stuffed with crabmeat and covered with cream sauce as my first course. For my main course I had some incredible prawns. Traci had ordered sea bass but didn't like it. She told the waiter and this seemed to alarm the maitre'd. He came over to our table very concerned and asking all types of questions like, "Is it not to your liking, Madame? Is there some way we can make it more suitable to your taste?" This place is all about customer satisfaction. He eventually took it back and allowed Traci to order another fish dish. This one was superb. 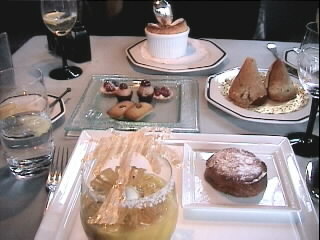 The course I enjoyed most was, by far, the dessert. It was made of pineapple and some other sweet goodies. I could have eaten that all day. "This lobster is so good!"